My trek from geeky highschool student to Associate Director at the Center for Teaching Development at the University of California, San Diego has definitely followed the alternative academic career path. When I finished my Ph.D. at the University of British Columbia in Vancouver, I jumped off the tenure track to teach math at a 2-year college in Vancouver. A few years later, I stepped halfway back into the Ivory Towers when I split my time between teaching introductory astronomy (#astro101) in the Department of Physics and Astronomy at UBC and being the resident astronomer at the H.R. MacMillan Space Centre (aka, the Planetarium) in Vancouver. I eventually ended up full-time in Physics and Astronomy at UBC, not on the tenure track but as a Science Teaching and Learning Fellow in the Carl Wieman Science Education Initiative. (Is there an adverb-form for gobsmacked or mind-blown? Oh well…) Gobsmackedly, I was in the office across the hall from where I’d first met my M.Sc. supervisor, Bill Unruh, some 18 years earlier. Now, I’m a faculty member in the Center for Teaching Development at UCSD, with the rank of Academic Coordinator. Never have I been on the tenure track. Never have I been able to put “Professor” on my business cards. And because of that, I have one regret (one is enough for this post): I’ve never felt the satisfaction and pride of having a graduate student. Because that’s what professors do, to move their disciplines forward. It’s their shoulders that the grad students stand upon to see further. When I hear from colleagues about the success of their students, I feel a wave of regret. This summer that wave was reduced to a twinge. Part of my job at UCSD is to teach a class called The College Classroom about teaching and learning to graduate students and postdocs. Some of the graduate students become Summer Graduate Teaching Scholars (SGTSs) and teach a course in the Summer session. As part of our ongoing support, I observe each SGTS’s class 2 weeks into the 5-week marathon and give them some formative feedback. Can I take all the credit? No, of course not, no more than a supervisor can take all the credit for grad student producing a succesful thesis. But I definitely had a role to play and, man, does it feel good. And, so, what about my circuitous trek through higher ed? No regrets. 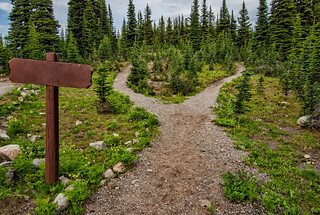 If you find yourself on a alternative academic path or you’re approaching the fork between tenure-track and not tenure-track, get on Twitter and follow the #altac hashtag. There are many others like you struggling with the same decisions you’re making. Hi Peter. I too have not had the experience of seeing a graduate student successfully defend their dissertation, but have certainly found my mentoring work with undergraduates very satisfying (on in-class or out-of-class projects). I’m hoping to have some opportunities to co-supervise graduate students. I’m very curious how the mentoring experience will change when it involves working with a person on grad-student timescales. Hi Peter. In the past few weeks, I have been thinking more and more about what I might want to do after my PhD comes to an end (planning to be done this year!). It was great to read your post and hear another story that doesn’t follow the typical academic path. I took your advice also and went to Twitter, starting at the #altac hashtag. I found a big community of people that have gone through and are going through the same thing I am. Really, it was creepy how close some of the blog posts were to describing some of my feelings. So far, I’m quite optimistic in the opportunities I will have coming out of grad school. In fact, one of my current tentative plans is to find a place I can get instructor experience as a stepping stone to something bigger, much like you described above. Any general advice for someone staring down the start of an #altac or #postac path? #altac is, almost by definition, not something with a definite trajectory. Sometimes it’s hard to find stories about people who leave the TT stream. My advice? Keep your eyes and ears open, follow #altac tweets and blogs, don’t fall into the habit of only watching people on the academic and tenure-track path. The exciting part is, the #altac world is changing and evolving so quickly, you could end up doing something that doesn’t even exist yet. Thanks for sharing, Peter – great to read about your path thus far and some of the feelings you’ve had along the way. And as a graduate student who associates with the euphoria successful mentoring can bring, it’s nice to know there’s still room for achieving this outside the walls of tenure-track. Glad I was able to put that feeling into words. From what I’ve seen, belonging to the #scicomm community is a viable trajectory into an #altac career — keep it up! Glad to hear you have no career regrets because, from my perspective, there’s nothing to regret. Your career path may have been alternative, but it’s certainly one I admire and aspire to. As another academic who’s path has deviated from the “norm”, I appreciate you sharing your story.